Test run • Clean buses will tend two routes this month. AL HARTMANN | The Salt Lake Tribune&#xA;The Utah Transit Authority is testing two natural gas powered buses on loan from Los Angeles. The cleaner-running vehicles could play a big role in the fleet replacement in coming years if the test is postiive. Bus operators Brett Morrill, left, and Carol Quigley take a look at one of the loaner buses at the UTA headquarters on Tuesday. Utah's nasty air and natural gas surplus would seem a perfect habitat for clean-burning buses, if not for a previous attempt to use compressed natural gas for public transit. Back in the mid-1990s, the Utah Transit Authority's environment-friendly buses proved too gutless for the Wasatch Front's inclines and altitude, and the agency charted a course toward cleaner diesel and diesel-electric hybrids instead. Now, with the advance of CNG engine technology and the enthusiasm of some board members for a homegrown fuel, UTA is ready to try again. A performance test of two buses  on loan from Los Angeles and Phoenix  starts today and runs for two weeks. If they can charge the hills effectively this time, CNG buses may play a big part in UTA's fleet replacement over the next four years. Besides reducing nitrogen oxide emissions, CNG buses could save a bundle of money. UTA this month tacked a 25-cent surcharge onto its $2 fares because diesel prices averaged more than $3 a gallon in the previous three months. CNG sold at Questar's Utah stations, meanwhile, currently cost $1.52 for a gallon equivalent. "I just don't see a downside," UTA board Chairman Greg Hughes, a Republican state representative from Draper, said. First, though, the buses have to perform. And while they follow the courses of two routes on 3900 South and Highland Drive/1300 East, the Utah Clean Cities Coalition will work with the U.S. Department of Energy to determine just how clean they are. The DOE's alternative fuels lab in Denver will test identical buses indoors using geographic information sent there by the buses on the ground in Utah, said Carrie Giles, northern coordinator for Utah Clean Cities. UTA can be a role model, both with CNG and the diesel-electric hybrids that it already is adding, Giles said. "They're both going to be a lot cleaner than the diesels were before," she said. "They're showing other fleets in the state that it's possible to be a giant fleet and have a mix of buses." The UTA fleet left much to be desired as recently as 2007. Then, a legislative audit found that the agency's old diesels pumped out enough nitrogen oxide to offset the environmental gains that TRAX electric light rail had made by taking cars off the road. At the time, though, UTA said it planned to drastically reduce emissions over the next decade, and that began last year with the purchase of 61 newer, cleaner buses. The new buses replaced vintage 1992-1993 coaches, and their nitrogen oxide emissions levels are 76 percent lower, said Dan Locke, UTA's environmental compliance administrator. By the time the agency replaces about 100 more relatively dirty buses with new diesels and some hybrids in 2014, he said, the 500-bus fleet should cut emissions 80 percent from 2007 levels. Switching some of those purchases to CNG could save slightly more. Doing so is a tradeoff, though, because hybrids actually outperform CNG buses on other smog components, such as carbon monoxide and volatile organic compounds. CNG equipment has a decided cost advantage over hybrids, though. 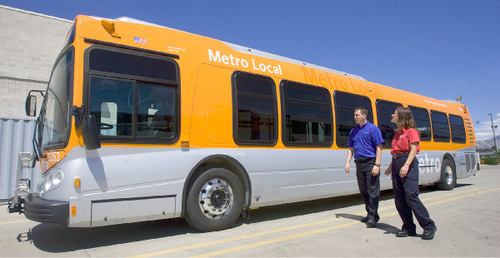 A new CNG bus costs about $480,000, compared to about $630,000 for a hybrid, UTA spokesman Gerry Carpenter said. Conventional diesels are cheaper still, at $430,000, but cost more in fuel over time. Hughes said he expects riders to benefit as much as the taxpayers who buy the buses. "We can create long-term agreements [with Questar] where you're not going to see these wide price swings and fuel surcharges," he said.